It's lighter and better-looking than any Pebble before, but the battery life and app compatibility mean those in the market for the brand may prefer a Pebble Time Steel. Update: Pebble has announced two new styles for the Time Round that are available for a limited time on its recent Kickstarter supporting the Pebble 2, Pebble Time 2 and Pebble Core. For US$199, you can pledge for a polished gold or silver model, each upping the bling-factor considerably over the standard brushed metal build materials. While the innards are the same, this is your opportunity to jump into the Pebble pool if the lack of a real stand-out look held you back before. Pebble is not like the rest of the big smartwatch names. Where Apple and Motorola use software most people have heard of and big bright screens, and offer limited battery life as a consequence, Pebble has traditionally gone with a much dimmer screen and custom software, enabling its devices to last way longer between charges. The Pebble Time Round changes all that. While its software and features are similar to the Pebble Time, it sheds the nerdy look, resulting in one of the most innocuous smartwatches you'll have laid eyes on. It's like Pebble's take on the Withings Activite, a watch you'd never know was smart from its looks. It's just a pity that such a design comes at a price, both monetary and in terms of slashing battery life from seven days to two and removing support for many key Pebble apps. It's a lovely little thing, though, if the limited feature set and £229.99 (US$249.99, around AU$350) price tag don't put you off. While I've just called out the Pebble Time Round as making a bit of a 180 on the Pebble mission statement, I can also flip that argument around. All Pebble watches have light hardware, small batteries and relatively slim frames. This one just pushes that angle way harder. Perhaps the greatest compliment I can give the Pebble Time Round is that I have had a panic a few times over the last couple of weeks, sure that I'd lost the thing. "What the hell am I meant to tell my editor?" It was still there, though, ticking off the day's minutes. The Pebble Time Round is one of the comfiest smartwatches I've used, and at this point I've tried most of them. There's no magic to this. The back isn't even ergonomically curved. It's just very light and has a strap that's all-but-guaranteed to be comfortable. At first glance it looks like a plastic strap, doesn't it? However, it's actually a very smooth, very soft leather one. There's none of the crusty bulkiness you get with so many leather straps. Its face is 38mm in diameter and thinner than many a conventional watch, casually throwing off the chunk tax that seems to weigh down just about every other smartwatch. Being a size-zero smartwatch ain't no big deal, Pebble seems to say. Such a style also means the Pebble Time Round doesn't care about gender. 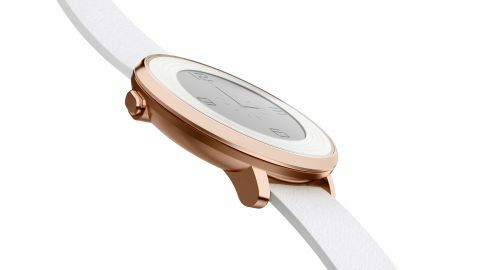 It'll fit on dainty wrists without looking ridiculous, and while you're looking at the version with the 20mm strap here, Pebble also makes one with a 14mm strap; you can't switch between the two because the strap's anchor points are actually part of the casing, so make sure you buy the right model. Where most smartwatches feel like they are secretly (or not secretly at all) made for dudes, with at most the odd nod to women, the Pebble Time Round designs are either gender-neutral or leaning towards a feminine style. It's a pleasant change. You've probably already spotted the bad thing about the Pebble Time Round's looks, though. Like the other Pebbles, there's still a great big area of screen surround between the actual display and the edge of the watch. It's something Pebble can't shake, and it makes the screen look a bit like a porthole, and appear smaller than it actually is. It means the Pebble Time Round doesn't seem as glitzy as an Apple Watch. But it's not really meant to, and it's still made of high-end stuff. The casing is stainless steel, and the screen covering is Gorilla Glass, as used in a lot of smartwatches and phones. A word of warning: the black coating on this particular version's display surround is very easy to scratch. The screen itself is similar to the style used in the Pebble Time but, no prizes for this one, is round. And has resolution of 180 x 180 pixels. In person it looks a bit like a Kindle screen, but has some dull-ish colours to it and much poorer sharpness than the very latest Kindle models. However, the tech is totally different. While you might see the Pebble Time Round display described as e-paper, don't confuse that with E Ink. This is actually a kind of LCD, which likely has more in common with one of those fancy graphical calculators a few of you probably lusted after back in school. For readers under 25: we used to use calculators in school. You can level plenty of criticisms at the display. It looks bit blocky, a 64-colour display appears dated next to almost any other smartwatch, and it looks little small too (it's 1.25 inches in diameter). All are valid grumbles. However, I still find this a totally valid alternative to an OLED display. The big bonus is that the screen is on 24/7, displaying the time. Some OLED smartwatches now offer an always-on screen mode, but this one is clearer than all of them in bright sunlight, because it thrives on ambient light. It's only indoors or on a glum day that it looks bit dim, at which point you'll want to call upon the blue-y front light. This automatically comes on when you press a button or make a flicking movement with your wrist. And there's also an ambient light sensor under the display to judge the required level. The Pebble Time Round is a fundamentally low-tech setup, though. There's Bluetooth and a note-taking microphone, but no Wi-Fi. And no heart rate sensor. And definitely no GPS. Sorry.